Disclaimer... there were no actual candy canes used in the making of this Candy Cane Coffee Cake. It's just the shape people! 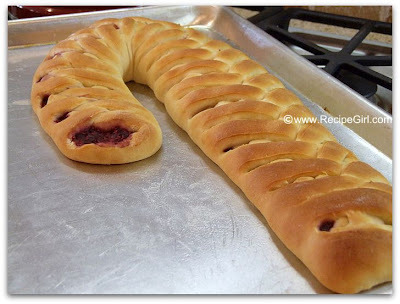 If you don't have opportunity to make this for the holiday season this year, you should save it for next season. It's impressive and delicious. 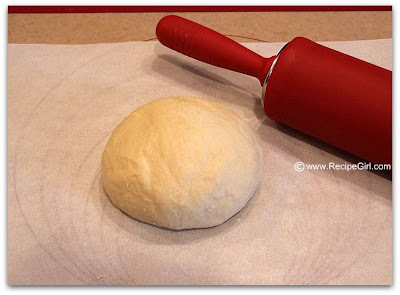 Make the dough (following the directions), and separate into three equal parts. Yes, this recipe makes 3 candy cane coffee cakes. I'm not really quite sure how you would cut the recipe into thirds to just make one... so just go ahead and make three- give two away to neighbors as gifts and keep one for yourself! 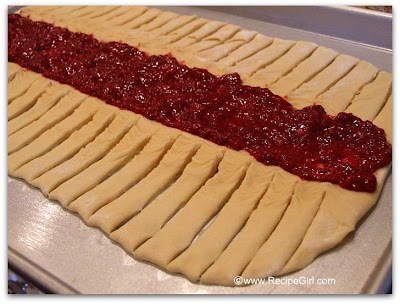 Roll the dough into a rectangle. This dough is easy to work with. It's incredibly forgiving, and it actually moves where you want it to go (this is coming from someone who can't make pie crust to save her life). 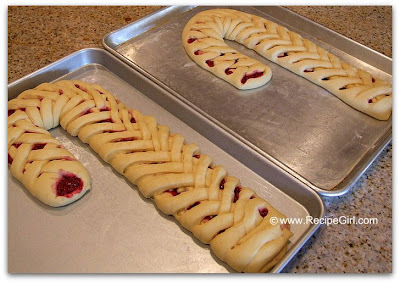 Spread this wonderful raspberry filling (you'll make this too, but don't worry... it's really simple) down the middle. You can use any sort of favorite filling, but since this is a candy cane coffee cake, red fillings will look best. 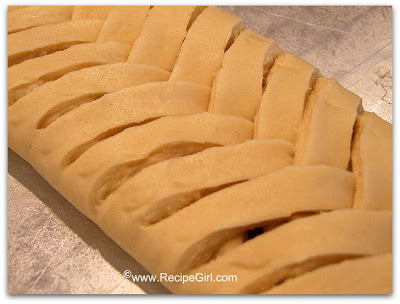 Cut half-inch strips with a sharp, thin knife along each side of the filling. Cross strips over the middle in a weave fashion- one side and then the other, etc. Keep weaving all the way up. Tuck in the ends. 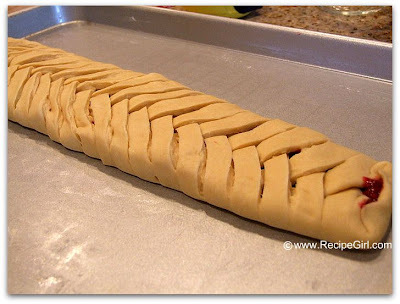 Gently stretch the whole weaved dough into a longer piece. 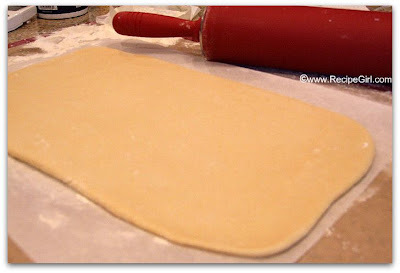 (Again, the dough is really easy to work with and shouldn't fall apart.) 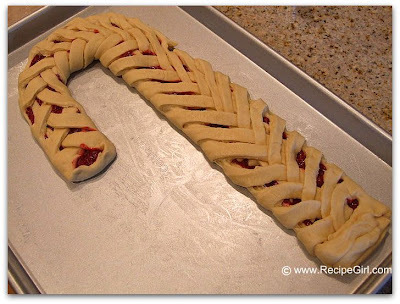 Turn the upper portion to form the top of the candy cane. 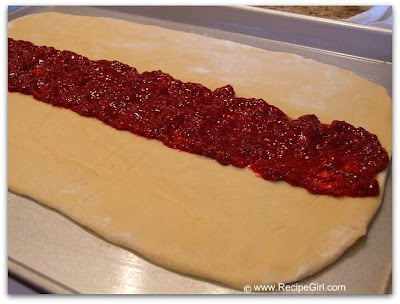 Gently move the dough around until it looks the way you want. Cover and let rise in a warm place for about an hour until doubled in size. 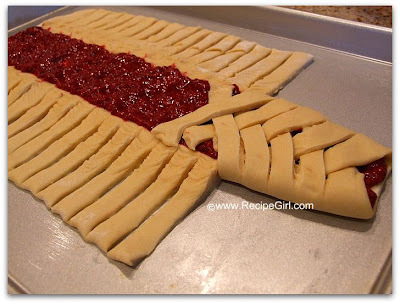 Bake for a short 15 minutes. 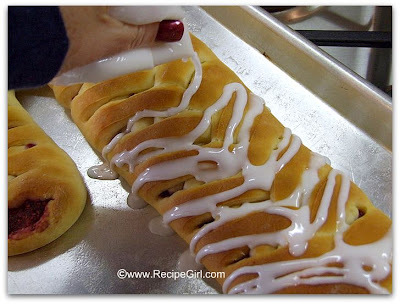 Drizzle an almond-flavored glaze over the warm cakes. 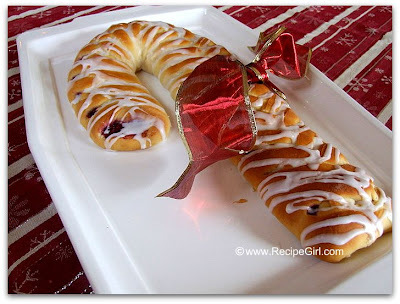 Let the glaze harden and wrap a little festive ribbon around the cane. I made two of these and took them to a holiday brunch. I had the opportunity to taste it and it was quite delicious. And there were all kinds of ohhhs and ahhhs from the women at the brunch! It does turn out to be quite adorable, doesn't it? The third cake I covered and refrigerated overnight (pre-rising). I took it out in the morning, let it rise, baked it up and dropped it off for the teachers at school. Good to know that you can do the delayed rise on this. Hope your holiday preparations are going well at this point! 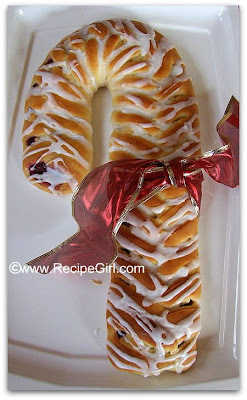 Check my recent blog posts for tons more holiday recipes.